Now that I have sufficiently expressed my irritation with the tendency of Spotify and those who obsess on it to tell us every day that tomorrow will be the day Spotify officially launches in the U.S., maybe I should take a look at it and see what’s what. 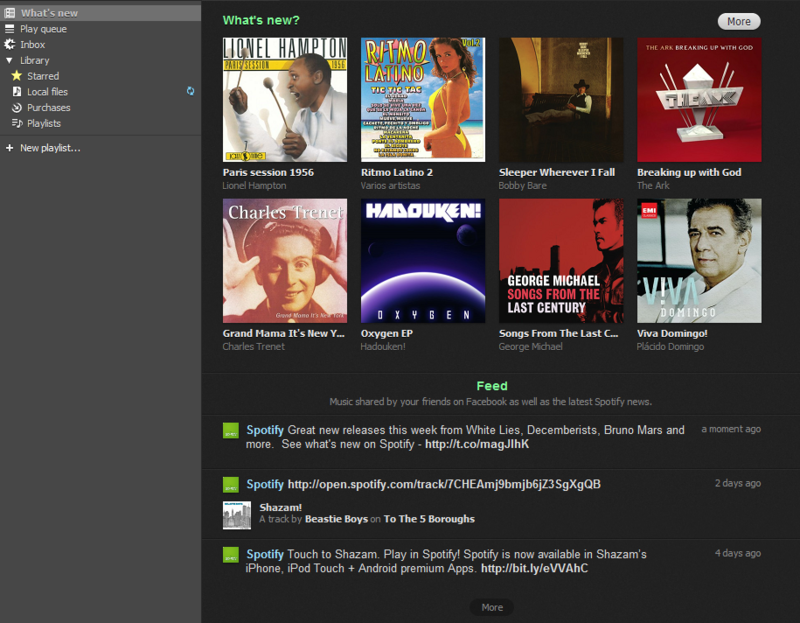 Here’s what will happen if and when we get access to Spotify here in the new world. After registering and downloading the Spotify music player app, you land at the Library page. When you click the “Start using Library” button, Spotify quickly scans your computer, imports your local music, and adds it to the “Local files” folder. I didn’t know this was going to happen, but OK.
There’s a “What’s new” link at the top of the navigation column, that clearly doesn’t yet know my musical tastes, though it knows my taste in bathing suits. Via the navigation column, you can create Playlists, and view and download to your computer the songs you purchase via Spotify. Let’s search for some music. How about The Avett Brothers. Tons of available songs. Local files are marked with a little icon on the right hand side. I decided to listen to one of my favorites, A Gift for Melody Anne. Plays immediately, via my Local files library. That’s pretty nifty, to automatically use the local file when available. The integration between local files and streamed content looks pretty seamless. Right click on the song in the main window and you can add it to your play queue and/or star it as a favorite. Now let’s try one that’s not local. When I Drink. No problem. Let’s see if I can share this via the little Facebook link. That will surprise some people. Worked like a charm. Let’s queue up some music, with some stuff that I know isn’t local. Easy as pie. There are some ads in the stream, but that’s to be expected with the free version. I really like that acoustic version of Bermuda Highway by My Morning Jacket. I think I’ll try to buy the record. I clicked on the name of the record and landed on the album page, with a handy “Buy Album” button. The 5 song EP was $2.85 (converted). No Paypal option, though. Had there been, I would have bought it on the spot (pun intended). Being a faithful music fan, I went to Amazon and bought the record. For $8.32! It wasn’t available in MP3 format. Would I use it? Probably so. I’d at least give it a try. Would I pay $8.00 a month (this is the UK converted price; if it ever comes to the U.S., it might cost more) for an Unlimited subscription, to lose the 20 hours a month time limit and the ads? Probably, but that would mean that I would pay for three premium music services. Spotify, Pandora and Slacker Radio. The on-demand nature of Spotify’s service would be a distinguishing factor that could very lead me to subscribe, assuming the cost was reasonably equivalent. How about $16.00 a month (this is the UK converted price; if it ever comes to the U.S., it might cost more) for all of that plus better sound quality, offline mode and full mobile access? I’m not sure. Maybe. It would depend on the iPhone app. My hunch is that it would be hard for Spotify to supplant Pandora and Slacker as my mobile music source. But you never know. The biggest problem I see right now is the jump from the $8.00 plan to the $16.00 plan (and again, it may be more in the U.S.) that is required to get offline (cached) access and mobile access. Slacker Radio gives you all of that right now for $48.00 a year. 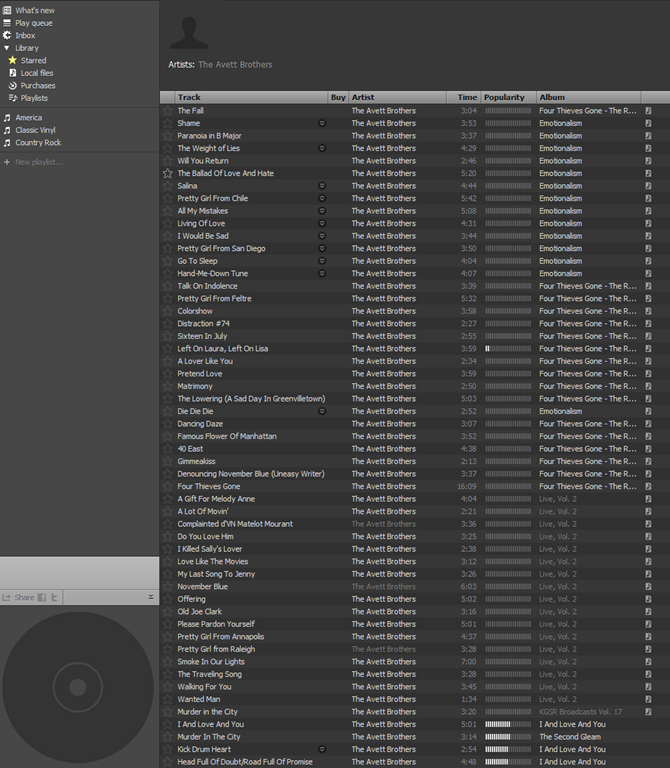 But in spite of that, I can’t deny that I find Spotify pretty appealing. Even if it’s only a mirage on the horizon at this point. Heck, if I can learn to like Facebook, I guess anything is possible. Posted on January 17, 2011 January 2, 2013 by KentPosted in TechTagged spotify.